Yes ladies, Hollywood to Housewife is back. A couple of months ago I asked you, my readers what you would like to see more of on here and what I heard was to bring Hollywood to Housewife back (along with some video tutorials…I am working on it!). I don’t know why I ever stopped doing Hollywood to Housewife, to be honest, so it was kind of nice and refreshing to bring it back! I wasn’t sure what I was looking for when I was trying to pick my outfit, mainly because our weather here has been so weird lately. Warm one day, cold the next-annoying to say the least. Because the weather has been so ridiculous I figured I would find an outfit with a basic, classic trench coat. A trench is something that never will go out of style, and can be a great transition piece when the weather is kind of cold but kind of warm. I also love it for its classy, put together feel. You could look like a hot mess under your trench, but toss that baby on along with some shades and a bold lip and you look like the most put together lady on the block! When I saw this picture of Miranda Kerr, I knew this was the look! I had everything I already needed to recreate this look plus I knew it was something that I would normally wear-comfortable and stylish. I hope to make this a weekly thing again, so plan on Hollywood to Housewife every Friday! I am sure most of you have these pieces, or similar in your closet now! 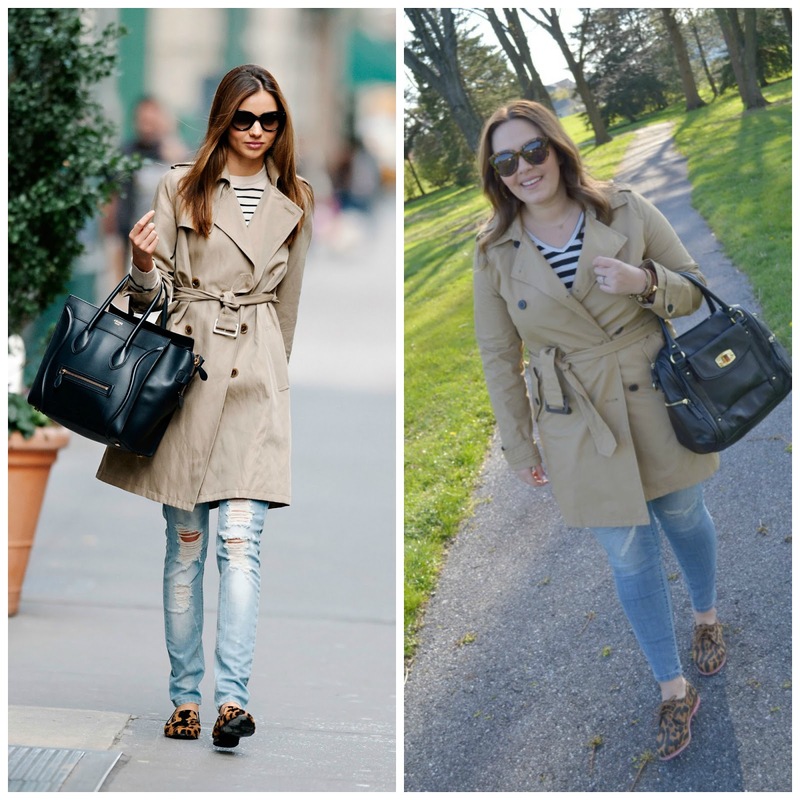 I will share a few of my top trench coat picks….every gal needs one in her closet!